This show’s how insecure RFID is right. Kyle Stewart built another cool Dev Board for the ATmega168/8 (same microcontroller used in arduino). The news thing about this board, is that it have a “vertical approach”, leaving more space on the breadboard for other components, a excellent idea! On kyle’s website you will find the schematic, eagle files and more. 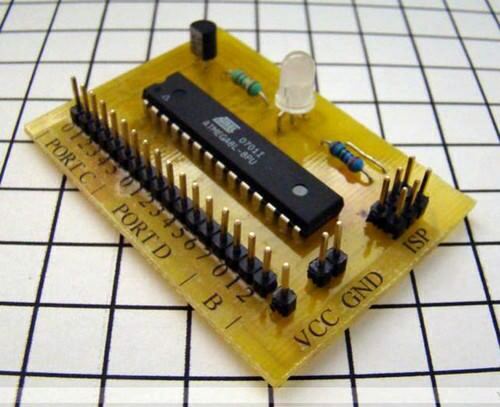 In case you think a arduino board is too much for your ATmega Development, you should check this board made by yourITronics. Using the microcontroller`s internal clock, and programming using an ICSP cable you can start developing right now! In the website you’ll find the scheme and the eagle file. You can buy a kit from the RRRF for $25 or check out the Sanguino website. I am totally going to get one!! !